Baan San Pluem is a beautiful beachfront condominium complex in the center of Hua Hin. The modern condominium has 4 floors and consists of 87 units. Units range from 55 sq. m for 1-bedroom to 85 sq. m for 2-bedroom to 130 sq. m for 3-bedroom units. All units are all fully furnished and are equipped with an European kitchen. 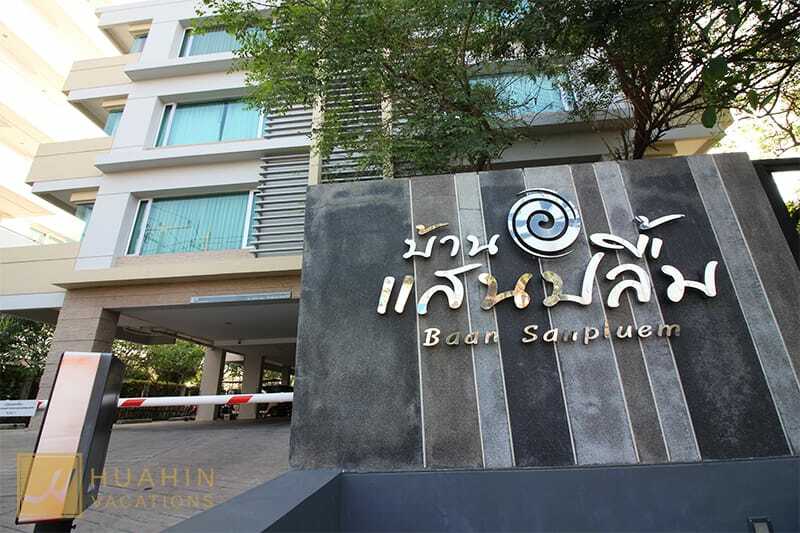 Located directly at the beach and in one of the most popular areas of Hua Hin center, Baan San Pluem is perfect for short- or long-term stays or to own a unit. A modern pool including a Jacuzzi with bright blue tiles gives you an impression of refreshing cool water. A kid’s pool is included so the whole family can enjoy the water together. The swimming pool is surrounded by a green area and trees that offer shade against the sun. Sun beds are available on the terrace near the beach. Have a look at the beautiful units we have available at Baan San Pleum!